Late last week we got the latest figures from the Reuters/University of Michigan survey. Consumer sentiment continues to recover with the preliminary June 2009 number at 69% - compared to 68.7% for May 2009. The consensus of economists was for a larger recovery but there is no doubt that US consumer sentiment is slowly recovering from the drubbing it got a few months back. Things were so extreme that we hadn’t seen such low consumer sentiment since 1980! But there was another data point that got my attention from the Reuters/University of Michigan survey. There was an increase in the number of people expecting an increase in interest rates from 36% in May to 53% in June. 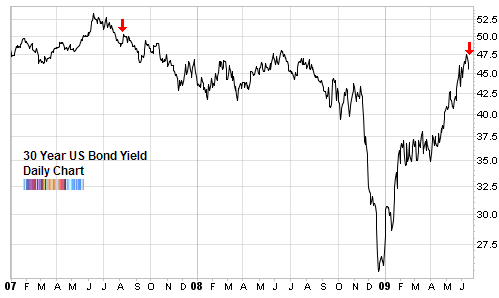 Keep in mind that bond yields and bond prices move inversely. So a fall in yield would be accompanied by higher bond prices. As you can see in the chart, the red arrow doesn’t coincide exactly with the 2007 summer peak in yields but then again, if we go back we find that the chart consistently trends downwards. In fact we could look back 10, 15, 25 years and more and still find that yields in a downtrend. Of course within this macro-trend there have been some very sharp counter rallies - of which the early 2009 rally stands out. You seem to be indicating that a extreme bearish sentiment reading implies that the opposite will occour, bonds will now rise, yields will fall, starting from the red arrow. If the economy remains weak, and the Fed continues to flood the long end, what will happen to 30 year yields? jeremy, I’d say that extreme sentiment is a necessary condition for a major trend change, but not a sufficient one. However, in this case it looks to me like we’re in for a period where bonds gain, the dollar gains, and stocks and commodities lose. Everything’s starting to fit into place here.